After last week's episode of Game of Thrones turned out to be a bit of an emotional rollercoaster, tonight's episode took a step back to move different pieces into place on the board, and catch up with characters like Sam (John Bradley) and Gilly (Hannah Murray), who had been absent for a while. Of course, the show's writers had to give fans something to talk about (aside from Daenerys (Emilia Clarke) giving an inspirational speech on the back of a dragon, of course), and so "Blood of My Blood" returned to the fold a character whom many had assumed was gone for good. No, sadly it wasn't Hodor (Kristian Nairn) in a miraculous escape from the undead horde. It wasn't Gendry (Joe Dempsie) either (presumably he's still rowing his boat somewhere). And it wasn't Catelyn Stark (Michelle Fairly) making a comeback as Lady Stoneheart - though that's the right family name, at least. As Bran (Isaac Hempstead Wright) and Meera (Ellie Kendrick) huddled in the woods, hunted by the White Walker army with Meera unable to carry Bran any farther, they were rescued by a mysterious hooded stranger who wielded a weapon similar to those used by the Children of the Forest. Once the three of them were safe (well, as safe as it's possible to be when you're north of the Wall), the stranger removed his face coverings to reveal himself as... Bran's uncle, Benjen Stark (Joseph Mawle). "It’s hard for me to talk about Benjen’s return without getting into the nitty gritty of the adaptation process. But, yeah, season 6 is rife with Stark reunions! That’s another thing that’s been very heartening to track with the fans. The show is so sprawling and there are so many threads, but, at its heart it’s largely about this good family that was torn apart. So seeing some of them connect again (Jon, Sansa), (Benjen, Bran) was very satisfying to write and to shoot. And it was great to have Joe Mawle back with us – it must have been a trip for him to step back into the character after so long – but he’s also decidedly not the Benjen of season 1, so that was fun to explore." The more optimistic Game of Thrones fan could interpret Cogman's statement that "season 6 is rife with Stark reunions" to mean that there are more on the way - perhaps Arya returning to her siblings, or Rickon being rescued from Ramsay Bolton's (Iwan Rheon) clutches by Jon (Kit Harington) and Sansa (Sophie Turner). He may have simply been referring to the reunions that have happened so far, but the universe does seem to be drawing the Stark family back together. 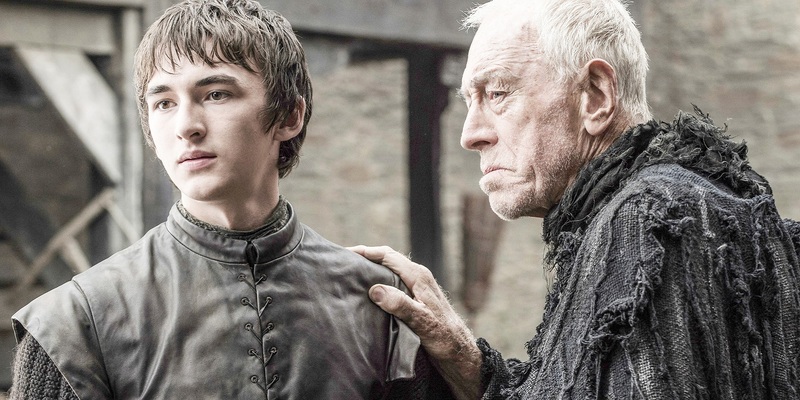 "I think it’s much cooler to have him show up now instead of guiding Bran to the cave. Because Bran already had Jojen and Meera for that. Instead he’s there to help pick up the pieces when their safe haven is destroyed and to give Bran to have that family connection again [after Hodor dies]." It's not just the Stark side of Bran's family that's making a comeback this season; "Blood of My Blood" also saw the return of Edmure Tully (Tobias Menzies), Catelyn Stark's brother, and indicated that we will see Brynden "the Blackfish" Tully (Clive Russell) again very soon, since Jaime Lannister (Nikolaj Coster-Waldau) has been charged with taking back Riverrun. Altogether this season seems to be really bringing the focus back to the Stark family, who have been scattered and beaten for some time now, but how many of them will survive to the show's conclusion? Game of Thrones returns to HBO next Sunday @9PM.